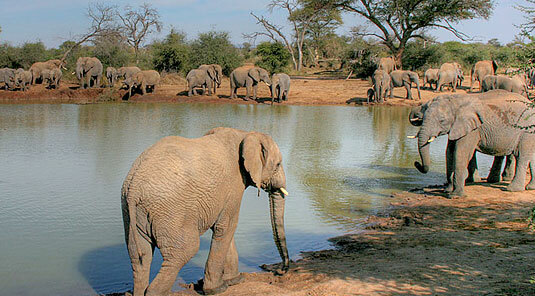 The 5-star Tuningi Safari Lodge is set in a valley on the western side of the Madikwe Game Reserve. Tuningi Safari Lodge can accommodate 16 (sixteen) guests in exclusive bush villas and the lodge itself has been designed in such a way that it can be divided for families, intimate groups or VIPs in search of utter privacy - a concept that is unique to Tuningi. As night sets in, lanterns and candles are lit and the mood goes from bush to baroque. 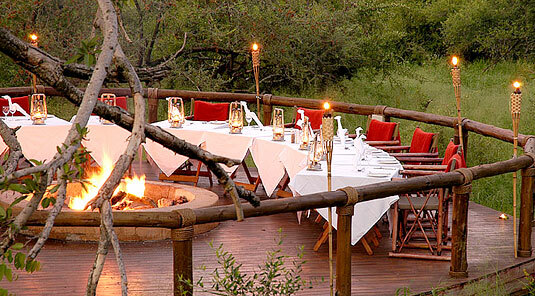 Guests return from their game drive to be presented with a bush extravaganza dinner, prepared by Tuningi's Executive Chef, in the boma with a cozy log fire. 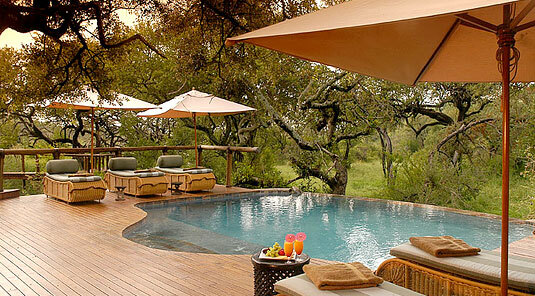 Tuningi Safari Lodge has eight (8) suites that can accommodate sixteen (16) guests. All rooms at Tuningi have air conditioning, ceiling fans, gas fireplaces, en-suite bathrooms, beautifully appointed baths, outdoor rock showers and private wrap around wooden decks. 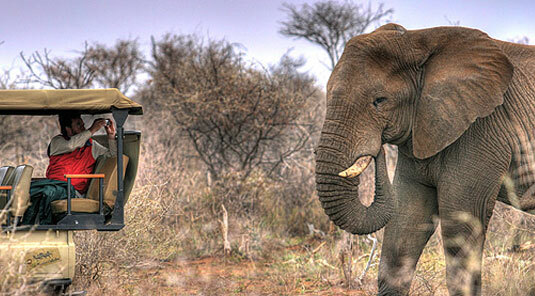 Early morning and afternoon the wildlife safari game drives in the Madikwe Game Reserve are extremely rewarding and will bring you close to a wonderful diversity of wildlife. 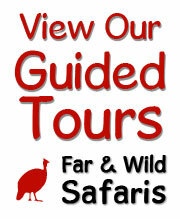 Other activities include dining in the bush and guided walks with highly qualified and experienced guides. 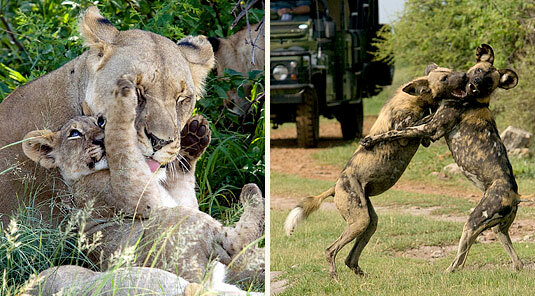 Lion, elephant, black and white rhino, buffalo, leopard - Big Five- also cheetah and wild dog - Magnificent seven. 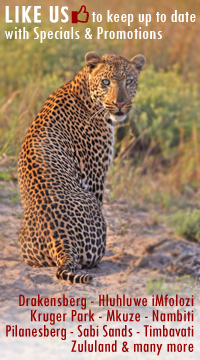 Giraffe, zebra, warthog, baboon, monkey, hippo, crocodile, and a variety of antelope including kudu, impala, waterbuck, Springbok, Wildebeest, Eland, Blesbok, Tsessebe and Steenbok are regularly seen, along with a number of the more elusive or less common animals. With a bird population of over 250 different species. Bring your binoculars! From Johannesburg head north on the N1 towards the N4 Toll road. Take the N4 Toll road north west towards Rustenburg, Swartruggens, Groot Marico and Zeerust. Once in Zeerust turn right at the second stop street into President Street. There is a signpost on the left that says "Madikwe Game Reserve/Gaborone" and a First National Bank on the corner to the right. Follow the R49 towards the reserve for approximately 97km. The first entrance to the reserve is Abjaterskop Gate. Pass that gate and enter Wonderboom Gate exactly 7km from the first gate. 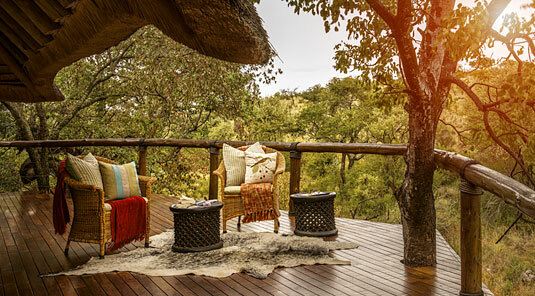 Tuningi is on eof the very few 5-star lodges in South Africa that welcomes children and by doing so, avails them to the wonders of nature, wildlife and our delicate eco-system. 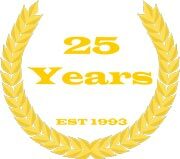 Creating Unique Holiday Experiences for Over 24 Years.